This post has been a couple of weeks in the making. I have reached a certain point with my stash now, where I really need to admit that I can't ever hope to knit everything I have, and scale it back. So, my main resolution is to do that. I will get rid of one third of my stash this year, either through knitting, selling or giving away. It's too pretty to be cooped up in boxes waiting for my retirement. This goal has informed my knitting intentions for the next 12 months. 1. Knit up all of the Cascade I have hanging around for roses for the rose chair. This might actually be enough roses to cover the chair. We'll see. 2. Knit up all the single skeins of Lion and Lamb I have into hexagons for the epic blanket of gorgeousness. That's six skeins; seven if I count Bated Breath which is the colour I am currently knitting. I use the word 'currently' under advisement there. 3. Knit another Central Park Hoody out of the black chunky tweed I bought from Emma's destash. That takes up shedloads of room. 4. Knit up the shawl kit I bought from Knitpicks in 2013. 5. Knit two other projects that use multiple yarns and that I have plans for - a several-coloured shawl for several blue DK skeins, and a variation on Ravello in an aran weight. That's probably it for now; having been through my stash at length yesterday, though, I would also like to knit some lace shawls out of some of that gorgeous laceweight silk I've kept festering in a box for years; and some socks; and something out of the Mirasol Miski I painstakingly stashed over a long period of time. Hopefully doing all this will help me to break double figures in the yarn-out calculator this year, although that seems very optimistic. Maybe I should give up my job. It's for a good cause, right? I was trawling through some pictures from our holiday to Crete today. We went in 2003, the day after I finished my PGCE. It was my last term-time holiday. We booked it through Teletext using the money I'd saved working at the pub one night a week for the first half of the course. How times have changed! That's not all that has changed. Sigh. I looked a lot better before the staffroom toaster ruined me. And age. And hard work. And stress. I still miss those sandals, they were ace. Start of term insomnia got me on Sunday night. I have now proved I can teach a full day on two hours' sleep. However, I can not be alert enough to remember to post a blue Monday at the end of it. So I've backdated this. From the Blue Lagoon, Iceland. School trip, 2011. Blissful! We'd had a 2.30am start from school that morning so this was ideal. I've had some great school trips. I booked a Reichstag Dome tour today for our school trip to Berlin in six weeks. Exciting! Having lived under a rock for the past few months, I have spent the past two weeks bingeing on Ravelry, gloating over my stash like Smaug (always a favourite holiday activity) and planning to knit All The Things. 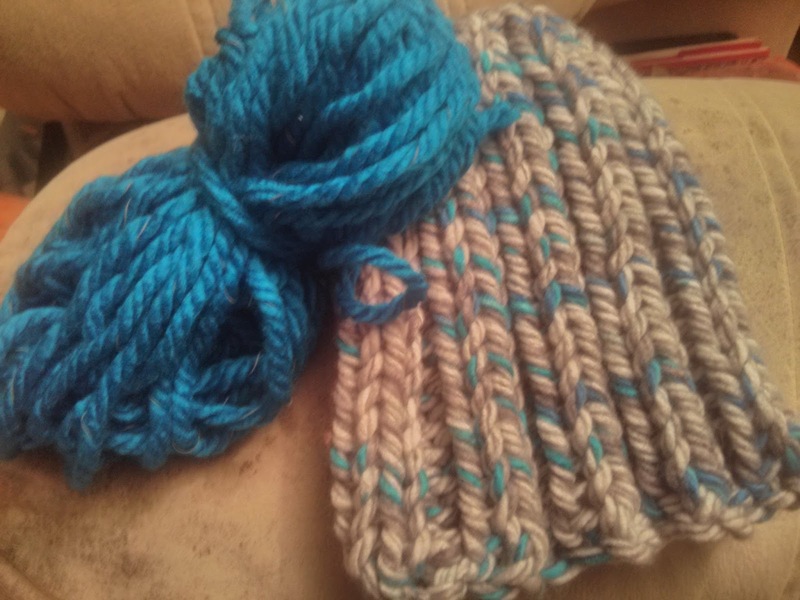 So, this weekend I have indeed been knitting All The Things. I don't have pictures, though. Sorry. I read this blog post, manned up and attempted to add a sleeve to my very old WIP on Saturday. I eventually managed to do the maths at knatterers (read: Jenny did the maths for me because I was too tired) and had a short-rowed sleeve by the end of Saturday. Alas, it was too many stitches and bulged in an unsightly manner at various points, so it was ripped out. I'm also not convinced I did enough short rows for a sleeve cap, in spite of following the blog directions carefully. I will try again. Maybe later. I started knitting a laceweight tunic a couple of years ago, in some gorgeous silk linen I bought at Wonderwool in 2013. I managed to do the short rows for the neck and then put it aside. When I picked it up again I realised the stitches were twisted, so I ripped it out, ready to begin again. Maybe later. I cast on for a pullover in the red alpaca Sib brought me back from Peru. It's a 40s-styled feather and fan affair from an old Interweave. I am currently knitting 1x1 rib over 292 stitches for an inch and a half. Hmm...maybe later. Just the bobble to make now. OK, one picture. Normal service (approximately three stitches per week) will presumably resume tomorrow.